From 1994 to 2007, Todd Farley carved out an increasingly lucrative career in the standardized testing industry, which left him more than a little cynical and disillusioned about student evaluation. 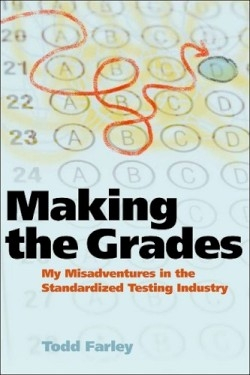 He was a self-described twenty-seven-year-old slacker and part-time graduate student at the University of Iowa when he took his first job as an $8.00 per hour “scoring monkey.” From this and his subsequent increasingly responsible positions, the author came to understand that standardized tests cannot assess the learning skills of the millions of students who take them. Farley and his fellow scorers were often required to grade thirty essays an hour—one every two minutes—using obscure scales. Hastily-arrived-at scores often decided whether students would be allowed to graduate or admitted to the university of their choice. To keep up with the enormous number of tests, the author contributed to the system he indicts by altering scores to ensure their reliability. In other words, scores were altered to fall into a range com-parable with previous years’ results. At the National Assessment of Educational Progress (NAEP), Farley became a range finder, responsible for creating numerical scales to assess performance. Although the book at times bogs down in descriptions of scorers trying to arrive at a consensus on what exactly they are scoring, some of these stories are painfully funny, such as the argument over whether or not dirt could be counted as a favorite food. Currently the author lives in New York and is a writer for several journals and magazines. His memoir is a passionate condemnation that reserves its harshest criticism for scorers, who he claims are mostly “dumb, apathetic, or unemployable,” and for the standardized testing industry itself, which he concludes has little regard for students but a lot of interest in making money. This revealing account is full of dark humor and asks many disturbing questions that will rouse debate among educators and concerned general readers.